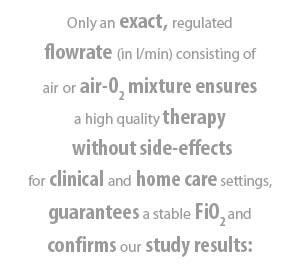 The therapy with nasal insufflation (TNI®) has been developed for the intensive and inpatient care in clinics as well as for home application. It has a high level of patient acceptance and is also suitable in cases in which the usual mask ventilation is not accepted. Even though TNI® (Therapy with Nasal Insufflation) has been a well-known method in the daily clinical routine for years, it is a somewhat newer method for respiratory support. It is a high-flow breathing method. The therapy is successfully in use in the field of intensive and inpatient care in clinics as well as in home care. The therapy with nasal insufflation is a well-known method in pediatric clinics for the respiratory support of premature babys and newborns and now the devices of the TNI® product line allow for its use in home care.